Tesco says that they are ‘passionate about good fresh fruit and committed to make sure that no good food goes to waste’. And with their Perfectly Imperfect range of frozen fruit and veg it seems they are keeping their word. In reviewing their operations in producing frozen fruit products they found that there was some fruit that was getting wasted in the process. The Perfectly Imperfect range looks to take out-of-spec or wonky fruit and vegetables and offer them to customers to help prevent food waste on farms and in production. The range includes cucumbers, strawberries, courgettes, pears and many other popular fruits and vegetables. From this new initiative 68 million portions of fruit have been saved from going to waste through the Perfectly Imperfect range. Whilst visual appearance is still important for many customers, wherever they shop, Tesco have found through research that it is taste that’s really important, as well as good value for money. There are a lot of broken fruit pieces on the production line, especially with raspberries and also wonky, small, misshapen and slightly damaged fruit. This fruit is still edible; it might just look a little wonky. 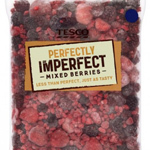 So the Perfectly Imperfect range puts all this fruit in a mixed frozen berry bag to save the food being wasted. Not only does this help customers waste less at home, but it helps them eat a little healthier too as frozen fruit counts towards one of your five-a-day. Tesco are now selling 22,500 packs a week making it their third biggest frozen fruit line. Pac ‘n Vac vacuum food storage containers are also playing a key part in the trend to reduce food waste. Pac ‘n Vac plastic vacuum food boxes create an instant, natural vacuum that keeps food fresher for longer, so you save more food, time and money. The plastic containers are made in the UK, BPA free, recyclable and have a low carbon footprint too.